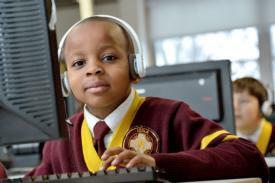 Iona Preparatory Lower School is a private, Catholic, all male elementary school for boys in Westchester County, NY. Established in 1916 by the Congregation of Christian Brothers, Iona is a faith based institution that follows the teachings of the Catholic Church, the charism of Blessed Edmund Rice and the Essential Elements of a Christian Brother Education. Our academic curriculum has been independently developed, incorporating elements of the New York State Standards and Essential Learnings of the Archdiocese of New York, utilizing a mix of traditional and progressive methodology and incorporating the current best practices for teaching boys. We are committed to keeping class sizes small for the benefit of all learners by allowing more frequent and regular teacher to pupil interaction. Currently there are 1 section each in grades K -5 which are taught in a self-contained model. Grades 6 – 8 have two sections for most classes and follow a departmental model of instruction. All students are expected to participate in the full academic program unless a student’s documented academic needs call for a modified program. Academic excellence is expected of all students at Iona. Our learning environment fosters this excellence by creating a nurturing, Catholic environment that celebrates the value and dignity of each person. Into that environment Iona Prep Lower School has placed a rigorous curriculum that promotes the growth of the whole child, develops higher order reasoning skills and prepares students for a lifetime of learning. 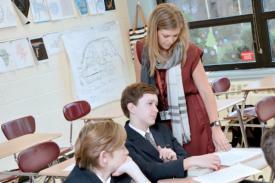 Iona incorporates many teaching strategies in an attempt to engage the broad spectrum of learners we encounter. All grade level skills are developed in a spiral curriculum format where skills are introduced, developed and expanded in each grade level. These skills include standard literacy and numeracy skills as well as higher order analysis and synthesis. We also devote time to the students’ executive functioning (organizational and planning) skills and develop their ability to present and communicate clearly. Technology is taking on an increasing role in the instruction of students. All classes incorporate some level of technology into instruction during the school year. Google Classroom and other Apps for Education are also being used with more regularity across the curriculum. Student progress is tracked by the classroom teachers through various assessment techniques and the whole school participates in standardized testing yearly using the Iowa Assessments to measure year over year growth. 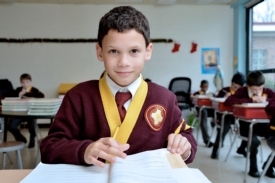 Students who graduate from Iona Prep Lower School do so fully prepared with the skills and knowledge necessary for success at the secondary level. Please click into the digital flip-book below for information on each grade level discipline.